YES we repair siding and soft metals. Book Our Siding Specialist. How Does Siding Repair Work? *Customer Provides Material Profile (Brand- Colour) and material is extra. 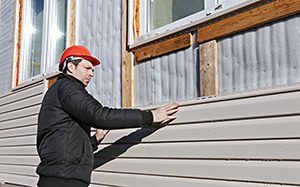 A siding repair specialist comes to your property to do a colour/profile match. Siding products do get discontinued every several years. Urban Siding assures to find you the best possible match available locally. There are cases where material needs to be special ordered and may take weeks to receive. We keep you informed at all times! If we are unable to find a product match and you need a third party report for insurance purposes- a 6-8 Piece sample can be mailed out to a Siding Match Program available in Ontario. This sample does not get returned to you. If this option is needed there will be an extra fee of $140 – includes shipping charges. We would inform you if this is needed – communication is key! Need One or Two Walls replaced only? Yes! We install partial properties as well! Same process may apply. Please contact us!